Should women be allowed to serve as pastors and elders in the church? Should women be allowed to teach a bible study filled with men? Who’s supposed to make the final decision for a family? Is a woman’s primary role to be home with the kids? Is it ok for men to be stay-at-home dads? Should a woman be allowed any career position in the workplace? How you answer these questions will determine if you’re a complementarian (the genders have equal value but different roles) or an egalitarian (the genders have equal value and roles). But the conversation re: this topic is getting more nuanced. Some churches claim to be complementarians and yet allow women to preach at their church while some churches claim to be egalitarians yet have few women leaders. Why so? Well, according to author Adrian Warnock, there’s now a gender-role spectrum within Christianity. As you can you see, each view has a different perspective of how the gender-role play out depending on the different contexts (home, church, role). Below I will provide my own summary and opinion on these different viewpoints. Belief: Christians who hold to a patriarchal view believe that men are in some sense superior to women and should lead them in every area of life. In other words, patriarchal Christians are the embodiment of every negative stereotype of traditional Christian men. Roles: Since a man should always be the leader, women should never hold any leadership positions in the workplace. Instead, she should remain at home and be solely devoted to the care of her husband and children. In the church, women should not hold an positions of leadership. Opinion: A lot of feminist confuse this with complementarianism, but most complementarians would utterly reject this view because it’s unbiblical to think men are superior to women - both are made in the image of God (Gen 1:27). Plus, this view can obviously lead to sexism and the oppression and devaluing of women. Belief: Men and women are equal in worth but “complement” one another through their different roles and skill-sets. Strong complementarians tend to be more conservative about this and generally believe that women should probably not lead men in any way since this would usurp man’s leadership. Roles: Men and women should have equal opportunities in the workplace. However, since men are meant to be the primary providers and women are the primary homemakers, this might affect her work opportunities. Therefore, it’s probably better for a woman to aspire to be a stay-at-home mother. In marriage, men should lead as “servant leaders” and women should submit as “empowering helpers.” These roles are not interchangeable. In the church, a woman should not lead a man (1 Tim 2:12), so all forms of formal leadership (elders, pastors, deacons) are reserved for men. In fact, it’s discouraged for women to lead men in any arena (e.g. small groups, bible studies, etc.). Opinion: This is often seen as the standard view of complementarianism, but as you will see, there are variations. While all complementarians view the genders having equal worth but different roles, they disagree on what those differing roles look like. While I generally agree with this perspective on gender-roles in the home, I’m a little more loose when it comes to church and the workplace. Belief: Same as above except there are some situations where women can lead men. Roles: Women should feel free to pursue any career and should not feel obligated to be a stay-at-home mom. However, husbands are still seen as the primary provider. In marriage, husbands are to lead and wives are to submit, but husbands are encouraged to discuss decisions with with his wife before making a final decision. In the church, women can lead in any leadership position (ex: deaconess, small groups, bible study) except for the office of elder/pastor (1 Tim 2:12). Opinion: Just to show my cards, I’m probably a mix between a moderate and strong complementarian. I think women can work anywhere in the world. I’m pretty convinced by 1 Tim 2:12 that women can serve anywhere in the church except in the office of elder or pastor. In marriage, I believe men are called to lead and women are called to submit, but decisions should be discussed together. However, the final decision should be the burden of the husband. Belief: Same as above except there are many situations where a woman can lead a man. Role: In the workplace, there are no distinctions between men and women. Therefore, either the husband or wife can stay at home. In marriage, the husband leads and the wife submits, but they believe Paul speaks about “mutual submission” (Eph 5:21), so the roles seem to be interchangeable. In the church, the senior pastor must be a man, but his wife may also lead as a co-pastor. What supposedly makes this different egalitarianism though is that female pastors can’t be the lead pastor. Opinion: Personally, I think if a Christian holds this view, they’re pretty much egalitarians. 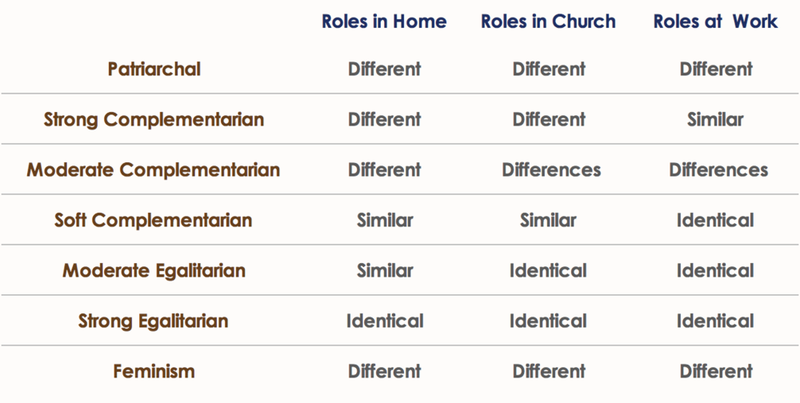 Even though there isn’t technically “equality” in roles per se, the line for me is when a church opens the office of elder/pastors for both men and women. But it’s helpful to understand why some churches with female pastors still view themselves as complementarians. Belief: Men and women have equal value and roles. In other words, the gender roles are completely interchangeable. Moderate egalitarians will base this belief on the Bible and still see it as authoritative and inerrant. However, they interpret key passages differently from complementarians. Roles: In the workplace, men and women are totally equal and can hold the same positions. In the home, marriage functions as a democracy of two where the roles are equally divided. In the church, all leadership roles are open to both men and women. Opinion: Some conservatives will view any church or Christian that ordain women as flaming liberals who have a progressive agenda. But I think you’d be surprised by how many biblical scholars and evangelicals come out as egalitarian (e.g. Gordon Fee, ). So while I disagree with these guy’s conclusions, I can at least respect how they got there. Belief: Same as above except they won’t necessarily believe the Bible is authoritative or inerrant. This is probably the main difference between a strong and moderate egalitarian. Roles: In the workplace, there should be total equality, In the home, marriage is a union between equals where the husband and wife take turns leading one another. In the church, all leadership roles should never consider a person’s gender; only a person’s gifts and qualifications should be considered. Therefore, a woman can lead a church as the senior pastor and do everything that a man does. Belief: Influenced by the three historical waves of feminism, feminist Christians tend to believe that women are not only equal but are in some sense superior to men. Roles: In order to compensate for historical injustices at the hands of the patriarchy, women should not only be given opportunities but should be favored to lead in the workplace, at home, and in the church. Feminine qualities are often affirmed and promoted while masculine qualities tend to be devalued. Opinion: While I believe the feminist movement brought some good into our culture and exposed a lot of evil and injustice that took place against women, I can’t help but conclude that it’s completely incompatible to be a Christian and a feminist. I think people who claim to be both tend to be ignorant of one or the other because the beliefs are just mutually exclusive. As hinted above, I find myself being a strong complementarian when it comes to the home but a moderate complementarian when it comes to the church and workplace. I think soft complementarians are just confused egalitarians who want to be cool with the conservative tribes. Soft egalitarians are still evangelical but strong egalitarians seem to stray outside the lines due to their view not of gender but of the Bible. And patriarchalism and feminism are, to me, just contrary ideas to the Christian faith. I don’t think a woman can call herself a “feminist Christian” anymore than a man can call himself a “patriachal Christian.” Both seem to misunderstand what those terms really mean.